Now that Halloween is over, it is time to think about all things Thanksgiving! 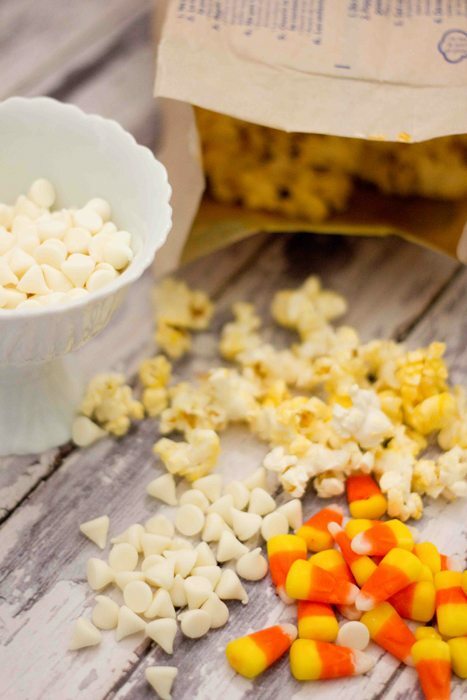 The only downside to the calendar changing to Novemeber… no more excuses to eat candy corn! 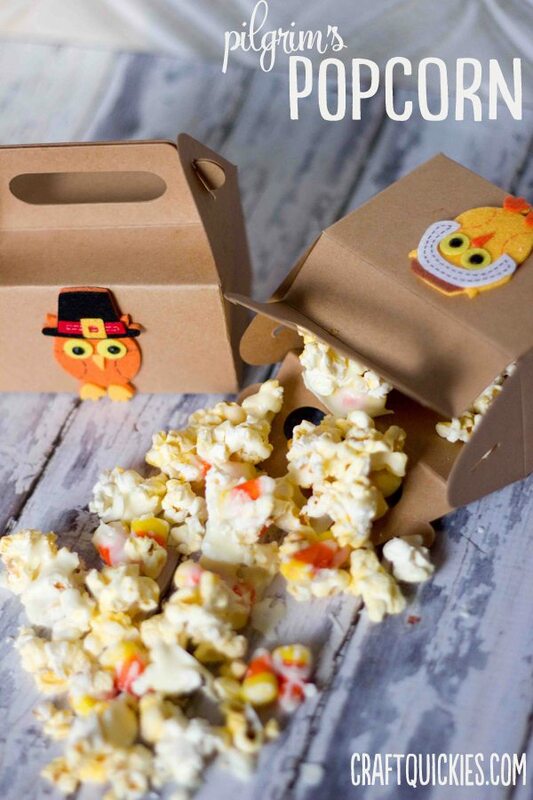 Run to your grocery store and buy up a few extra bags on sale (like you don’t anyways…) and get some fun treat boxes- because this sweet treat is sure to brighten up the day of any little Pilgrim! First off, pop your popcorn, and then spread out on a baking sheet covered in wax or parchment paper. In 30 second increments, microwave the white chocolate chips removing it at the end of each 30 seconds to stir. When fully melted, drizzle in the oil to make the chocolate easy to drizzle. Stir to completely incorporate oil. 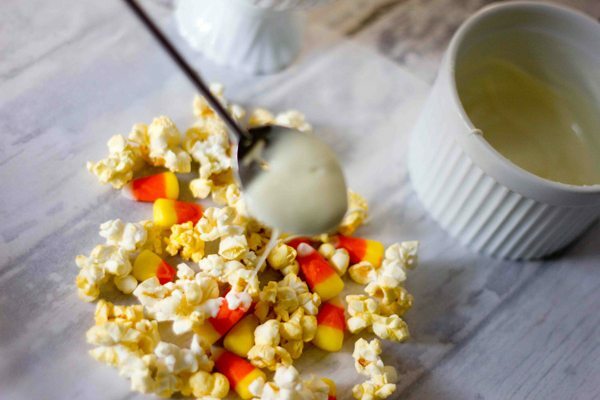 Drizzle over popcorn and sprinkle with candy corn. Set in freezer for 10 minutes to firm up, then break apart into small chunks and serve! I placed mine in adorable treat boxes I snagged at Pick your Plum and decorated them with super cute felt owl stickers from Jo-Ann’s. Took all of five seconds, but they are SO cute and a fun way to present a snack to your kids! What are your favorite Thanksgiving treats? How are you getting your little ones ready for turkey day? For more great ideas from all over the web be sure to follow my Thanksgiving Pinterest board. Such a cute idea! Love the little bags! I just stumbled across your blog and saw this yummy looking recipe! It looks so easy that I’m going to have to make some this weekend. As a test. To make sure it’s okay to eat. And then I’ll make some more in a couple of days. And more a few days later. All in the name of research! I have a link party that I invite you to share this recipe with. It’s Party in Your PJs on Grandma Ideas http://grandmaideas.com. It runs through Sunday evening at midnight. Feel free to share this idea and a couple of others — I’m sure my readers would love them! Popcorn and chocolate! Wow! I’m so doing that! Love the boxes too! 🙂 Thanks for sharing at Fiesta Friday – don’t forget to link up so your readers can come and join the party too!